May your 2008 be full of craftiness and fun! Mine started out well. For Christmas, I received an Ashford Traveller spinning wheel (single drive) from my parents. It's lovely! No name yet, but I plan on breaking out a map of New Zealand and finding an appropriate name. Unfortunately, one of the parts was defective and I was unable to use it. When Mike got back from seeing his family for Christmas, he took a look at it and fiddled around and managed to "fix" the defective part. I started spinning on the 29th and I had my first ball of yarn (and a small knitted wristlet) by the 30th! I've been spinning every evening ever since. Right now, I've got some semi-laceweight BFL from Blue Moon in an autumnal colorway spun up. I'm almost done with my first bobbin. I plan on filling another (I have enough for three full bobbins, I think) and then plying them to see the weight and check the yardage. 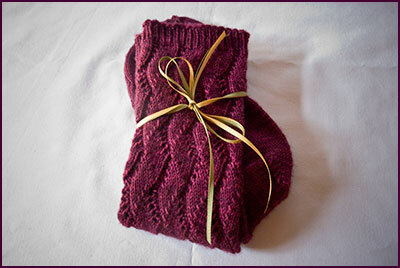 I plan on knitting up a lacy autumnal-themed thing. Perhaps a scarf. I need to find an appropriate pattern (suggestions are welcome)! Anyway, I plan on being better this year with my craft journaling. I have completed many projects and I don't have records of them and I really should start. Hopefully, I'll find my camera soon and can start taking pictures. Hee hee! 2008 has started well in the crafting department and I'm looking forward to seeing where this next year takes me. I completed my Sockapalooza 4 socks for my pal on Monday. Now they are washed, blocked, and ready to roll! This is the package I sent to my pal. I thought the yellow and green ribbon would go well with the wine colored Colinette Jitterbug that I picked out for my Sockapalooza pal. She said that she primarily liked greens and blues and I tried finding a colorway that really spoke to me that had both, but nothing really turned me on. I initially purchased some Lorna's Shepherd Sock in Watercolor and knit a full sock using "Merino Lace Socks" from Favorite Socks: 25 Timeless Designs from Interweave, but I decided that the pink/mauve in the colorway just jumped out too much. So, I poked around some more and I spotted the Colinette. I pondered getting either the forest green semi-solid Jitterbug or the jewely-blue Jitterbug but my sock pal said she was getting into "wines", so wine it was! Over the summer, I've came to accept my love of violets/purples and I thought I'd pass on some of that love. Hee hee. It is gorgeous. Colinette is so sprongy, it's amazing. I've got left-over yarn, so I plan on making some footsies for me with the remainder. 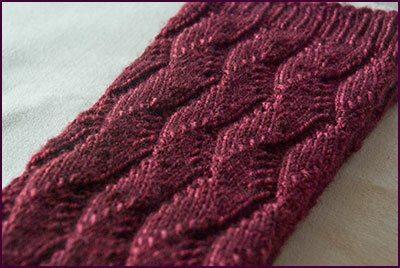 I used the cover pattern, "Waving Lace Socks" by Evelyn A. Clark, from Favorite Socks. Sooooo pretty! The pattern is easy to memorize for a 8 stitch, 20 row repeat. I need to make myself a pair. I also thought I'd put in a few stitch markers for my pal. 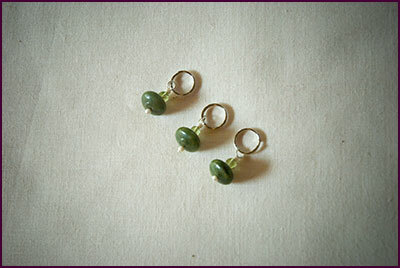 These I made with peridot and chinese nephrite and pearly seed beads. 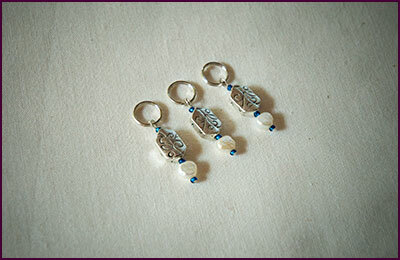 These were made with some silvery-metal (no idea what metal it is), freshwater pearls, and blue seed beads. Yay! I've joined another knitting swap, since my needles really wanted to get more sock knitting done. What Hogwarts house have you been sorted into? This time, I'm in Slytherin. I don't know why, but I tend to get sorted into Ravenclaw, Slythernin, and Gryffindor about equally. I'm not nice enough to get placed into Hufflepuff. Hee hee. Hmm. This is a tricky question, because I utilize the magic loop method to knit my socks, not double pointed needles. I typically used double pointed needles like a crochet hook, when I need to fix my yarn or like a cable needle to hold it while doing something else. My knitting needle of choice for sock knitting (especially since I prefer to do lacework with my socks) are Addi Turbo Lace, 32" US1. Would you like to try a brand new needle? If so, which brand? Size? Length? Sure! I'd love to try Skacel's steel dpns (US1) or any 4" dpns, like Suzanne's (wood and a bit on the pricey side... and they are for "gloves" so they are larger) or HiyaHiya's 4" dpns (US1, I think they are stainless steel). If you'd like to get me a circular needle, then addi lace in any size 47" lengths (which I don't have yet) would be absolutely brilliant too. US1s are my needle size of choice and I typically have multiple projects, so I know that any needles I receive will be used and loved. Allergies? Do you have any? Will your knitting be exposed to smoke or animals? I have no allergies. My home is a smoke and pet-free zone, although I do have a LOT of wool yarn and fiber (I spin to) lying about, so I'd be concerned if my sock partner is allergic to wool. Are you an international participant (outside US)? Are you willing to have an international Hogwarts Sock Pal? I am from the US, so I'm not an international participant. I would love to have an international partner!